I never do movies, so this one must have got to me. If you're tired of your TV/DVD Collection then you might want to check this one out. Short synopsis: Morgan Freeman plays an aging actor who no longer commands the big roles- so he has agreed to scout out the location of a low budget independent film that he has been offered a part in. It's in L.A. and at a Spanish Grocery. 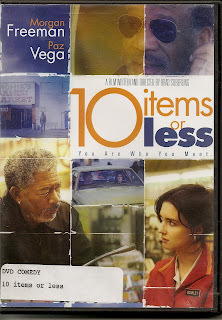 There he meets Scarlet,who is from Spain(played wonderfully by Paz Vega)the checkout girl at the 10 Items Or Less register. Initially skeptical of him as he checks the place out, he slowly draws on her insecurities and tries to build her up. After he becomes stranded at the store on the eve of the Jewish Holidays she agrees to give him a ride but has to stop for a job interview first. This is her first attempt, at 25, to get a real office type job. He preps her for the interview by going to Target, doing an impromtu interview with her in the car and just getting to know themselves through one another. A warm and uplifting film and well worth the time to watch. In the end you realize that it is only you that holds you back. You can do what you want. You just need to try. It's okay if you fail. It's never okay not to try again.